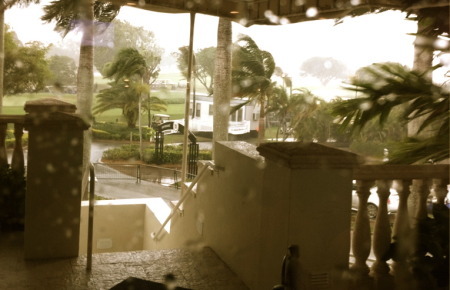 A vicious thunder and lightning storm delayed play by some two hours and forty-six minutes at Doral’s TPC Blue Monster with winds gusting up to 52mph destroying two TV towers, one giant scoreboard and an estimated 17 palm trees across the famed Miami resort. The winds of change have also been blowing in world golf for several years but it still remains to be seen if Tiger Woods will return to the stellar levels of the early 2000s, when he dwarfed the rest of professional game like a colossus. Debate is raging inside the game about Woods’ ability to get back to playing the kind of golf that has brought 14 major titles - 13 of them coming during two distinct periods of his career. Following his Masters win in 1997, the Californian won seven majors between the 1999 US PGA and the 2002 US Open before rebuilding his swing and returning to win another six majors between the 2005 Masters and the 2008 US Open triumph at Torrey Pines, where he won on one leg. The huge upheaval in Woods’ life that began with a 2009 car crash that ended with a string of sleazy revelations of multiple affairs and eventual divorce, has destroyed his perfectly groomed image as the perfect sportsman. Separated from his wife and children, he is now embarking on the third major swing change of his career with the Canadian coach Sean Foley. But those who believe that Woods is unlikely ever to regain his old dominance are beginning to outnumber the faithful. Even Foley has suggested that we will never again see Woods win a major by 12 or 15 shots - as he did in the 1997 Masters and the 2000 US Open respectively. But the newest guru in the game is still confident that his man will be back. Whatever about Tiger’s ability to come back and win again, the opposition is stonger than ever. Technology has levelled the playing field, allowing players with less than perfect techniques to hit the ball further and straighter than before. Then there is the age factor and a 35-year old Woods is obviously not the physical speciman who dominated in 2000s. Irish fans have been frustrated by Padraig Harrington’s constant swing changes over the years, despite his major success in 2007 and 2008. Harrington has used technology to try and create a swing that allow him to play on at a high level for another five or six years as the sport takes its toll on his body. It is a similar story for Woods, who has suffered knee and achilles tendon injuries over the past decade. Old school heroes such as Lee Trevino cannot understand why Woods would want to change a winning formula. Trevino said: “You are winning six tournaments in a row, and then you are holding all four (major) trophies at one time, and then you change your swing. What the hell for? Who are you trying to beat, yourself? He succeeded. He beat himself. I don’t know how you do that. “Tiger is very dedicated to the game. He has a passion for it. I had the same thing, but I never changed my swing. My passion was getting a lot of confidence. My confidence came from out of ground. The more I practised, the more confidence I got. Everyone has an opinion and while TV commentator with former major winner Johnny Miller doubts that Woods will get back to his best, comparing his decline to the fall of the famously unstable former heavyweight champion Mike Tyson. Woods has never liked Miller, one of his most vociferous critics, and has more respect for Jack Nicklaus, the man whose record of 18 major wins he has made it his life’s ambition to beat. Nicklaus said at last week’s Honda Classic that he still expects Woods to go on and set a new record of 19 major wins. That’s the kind of talk Woods like to hear. After all, the words are coming from the man who failed to win for the first time in his career in 1979 but then reworked his swing and came back to win the US Open and the US PGA the following year. There was a time when the golfing world ground to a halt to watch Tiger Woods and Phil Mickelson go head to head. But when players that dominated the game for so long meet for the 27th time in their careers for the first two rounds of the WGC-Cadillac Championship at Doral’s TPC Blue Monster, Irish eyes will be firmly fixed on the highest ranked player in the three-ball, Graeme McDowell.